If you think Myeongdong is only famous for fashion and shopping, you missed a best part of it. Surprisingly, many locals come here for the food and restaurant. Wandering what to eat at Myeongdong? Myeongdong Gyoja (Myeondong KyoJa / Gyoza) 明洞饺子, the restaurants which is most famous for its meat dumpling and hand made noodle is not to be missed. 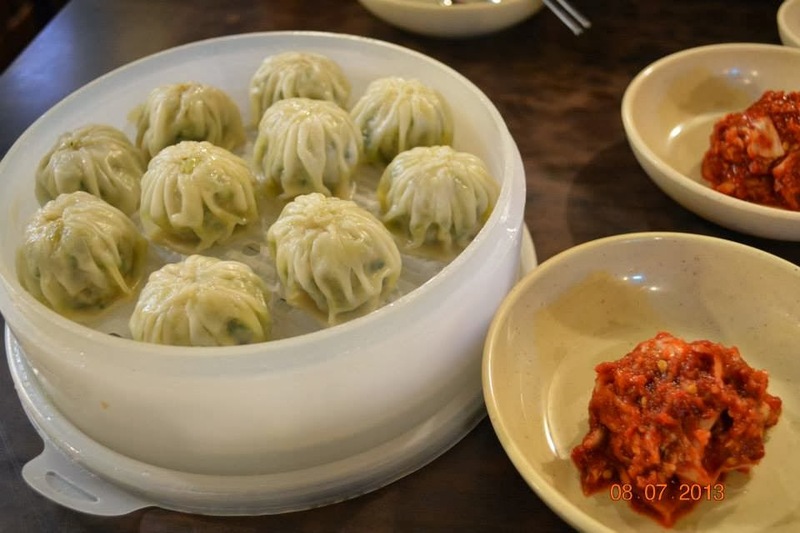 For over 40 years, Myeongdong Gyoja has been the local favorite in Myeongdong and the greater Seoul with its authentic Korean Gyoja and noodles at very affordable price. Despite the fact that many new restaurant and eateries being set up in recent years, Myeongdong Gyoja continue to have crowd to its door steps. 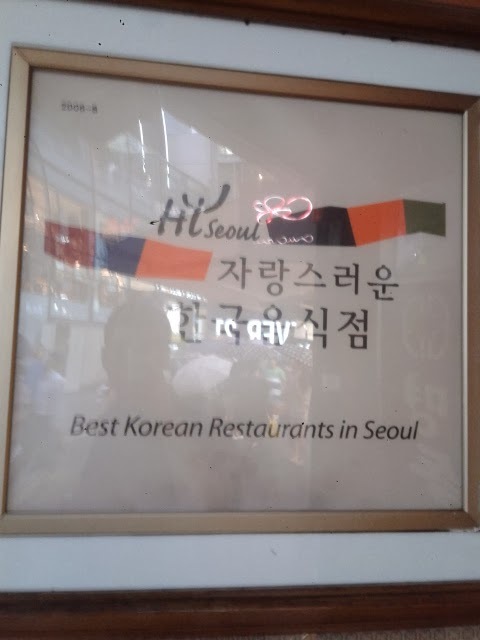 No wander it was awarded the Best Korean Restaurant in Seoul! 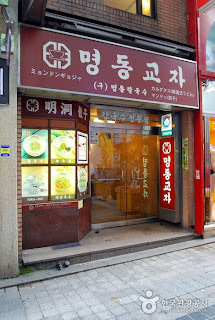 There are two Myeongdong Gyoja shops in Myeongdong. Despite having two shop on the same street, with only 200 meter apart, both shops are always busy with continuous flow of customer. 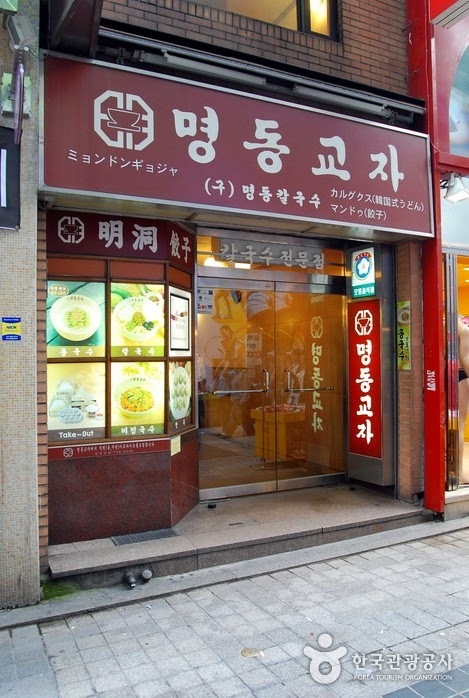 If you are not staying at Myeongdong, the easier way to get to Myeongdong Gyoja restaurant is by taking the Seoul Subway train. 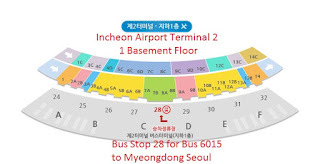 Just take a train on LINE 4 of Seoul Metropolitan Subway to arrive at the Myeongdong Station. Upon arrival, get out of the station using EXIT 8. The map to Myeongdong Gyoja restaurant (Shop 1 and Shop 2) are as below. From EXIT 8 of Myeongdong statoin, walk for a few steps and turn left into the first alley in this photo (Turn left when you see the bakery. Walk straight for about 100 meters to get to Myeongdong Gyoja Shop 1. When you get out form EXIT 8, just walk for less than 10 meters and take the first left turn to go into the street / alley leading to Myeongdong Gjoya. Go straight for about 30 meters to get to a cross junction. At the junction, go straight (do NOT turn left or right). 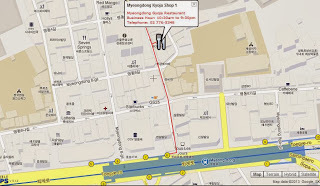 Myeongdong Gyoja shop 1 is only about 60 meters from the cross junction. 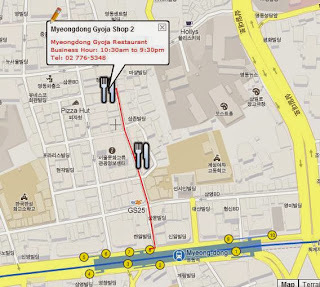 You should find Myeongdong Gyoja Shop 1 on your right. Myeongdong Gyoja Shop 1, on the right. If this shop is full or the queue is long, you can continue walking along the same street for another 100 meters to get to Myeongdong Gyoja Shop 2. This shop is on your left as shown in the photo below. Myeongdong Gyoja shop 2, on the left. Once you are there, the waiter and waitress will help you to get you seated. There are only a handful of items on their menu but all of them are really good. Just pick what you like but don't miss its famous gyoja! Last note, try the special made source that goes really well with the Gyoja dumpling. It is really appetizing. 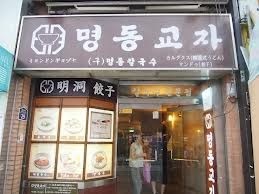 Rice is provided complimentary at Myeongdong Gyoja. Hello. Gjoya is dumpling containing pork. How much is the food? Price of menu in Myeongdong Kyoja is very cheap. For example, prices of Mandu (dumpling) and Kalguksu (handmade knife noodles) are all less than KRW10000. 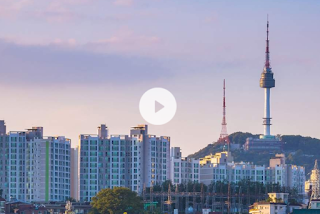 Enjoy the delicious food in Myeongdong! Hi. 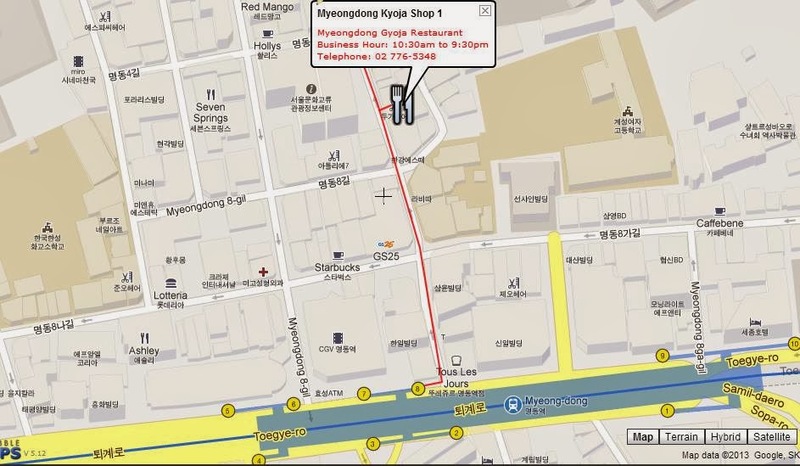 What time does Myeogdong Kyoja close? Thanks. Myeongdong Kyoja closes at 9.30pm. It opens at 10.30am. It opens 7 days a week throughout the year and only close on New Year Eve and New Year Day. hello..ur blog is verry helpful, i will be in korean on 2/11/17 can u suggest to me halal korean food in myeondong?